UCLA Alzheimer’s and Dementia Care patients and their caregivers will receive an invitation to participate once start dates are confirmed. Alzheimer's disease and other forms of dementia slowly leach away a lifetime worth of memories and social relationships, until the only thing left are fragments. Dementia is an isolating disease that frequently leaves the person afflicted feeling alone, lonely and bereft of opportunities for social interactions. The spouse, adult child, relative or friend who is a caregiver of a person with memory problems often experiences physical and emotional strain and can benefit greatly from a short break in their caregiving duties. An innovative and unique intergenerational program at UCLA gives seniors an opportunity to mentor bright, enthusiastic college students while giving their caregivers a much needed break. 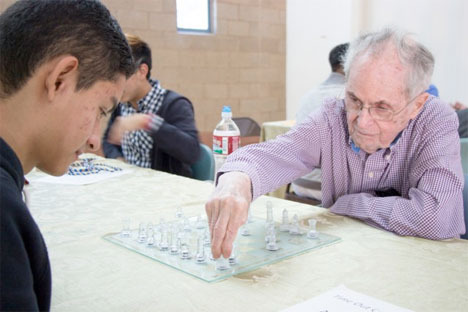 TimeOut@UCLA is a student-run respite program offered free-of-charge to older persons who need companionship and enjoy socialization and meaningful conversations.